Most of us around here are happy about last night's basketball game...The second meeting between Duke and Carolina this season, and though we lost the first game, the HEELS won last night's match up. Facebook was alive with happy UNC fans before, during, and after the game since we led the entire time. Now, if I had written this post 20 years ago, I would have been very disappointed in the outcome of the game. If I had written this post 25 years ago, I would have loved that Carolina had won. Confusing? The explanation is even more confusing if you are familiar with the Duke/Carolina rivalry. I, Katherine Campbell, like both Duke and Carolina. I realize that several of you might have just thrown your laptops across the room and un-followed my blog. I do have a reasonable explanation for those of you who are still reading. I grew up a tarheel fan. My parents are tarheel fans. My sister is a tarheel fan. I have fond memories of ACC tournaments in Charlotte, pom poms with carolina blue and white streamers, and a newborn sister who came home in a UNC onesie from the hospital. Then came the rebellion. I was a really good kid. But all kids need to rebel in some way, and this was my outlet. I became a Duke fan. It didn't break my parents hearts, thank goodness. They dealt with the rebellion in a very healthy way. They allowed my rebellion and even supported it, probably knowing that if they forbid it, they would lose me to the Blue Devils forever. They took me to Duke basketball games, they bought me Duke t-shirts and Duke posters for my room. They even took me on one of my Dad's sales calls, where I had my first run-in with my heart-throb, my beloved Quin Snyder. I continued to love Quin Duke throughout high school. But as I entered college, Carolina started to sneak back into my heart. And eventually I went back to my roots. 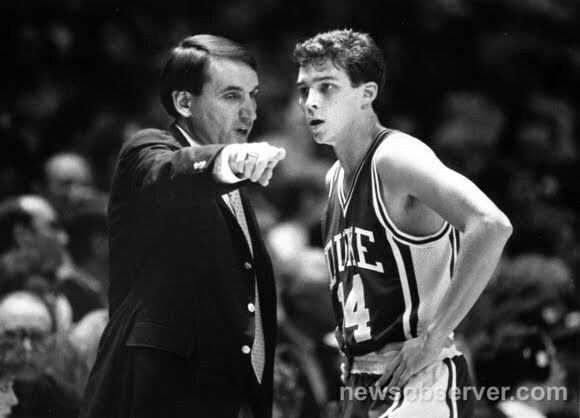 But I did not lose all of my love for Duke. I love them both. But if they are playing each other, I love the HEELS more. But in case of a not so super outcome to last night's game, I decided to make an alltheway super dinner. I have mentioned this dish before, when I shared my trip to Birmingham to visit my cousin Will. The greatest thing about this dish is that you make your own pasta....you don't need anything fancy. However, it is a little time consuming, and the thought of making pasta from scratch is intimidating probably for the few readers still out there. So I have simplified the recipe for that reason. You can buy gnocchi in the pasta section of your local grocer. 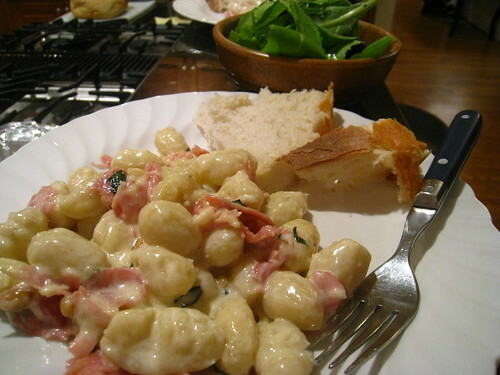 The shelf stable gnocchi is made from potato, and the recipe I have is ricotta-based. After you try the store bought version, let me know how much you love it and I will teach you to make the gnocchi by hand. Beat 1/2 cup cream until whipped, set aside. Do not substitute light cream, it will not whip. Trust me on this one. Set aside. Melt butter in sauce pan, add pine nuts and cook until nuts brown a little. Add 1/2 cup cream to butter and pine nuts and bring to a light boil. Cook for one minute, then turn heat down to low. Add basil and prosciutto. Fold in whipped cream and parmesan. Add gnocchi to boiling water. Once they float (just a few minutes), they are done. Remove with slotted spoon as they float to surface and add to sauce. Serve immediately. If you eat this the next day for leftovers, the sauce will separate, so I do not recommend making the sauce in advance. You can make and shape the gnocchi ahead of time if you decide to make your own. It really is a great recipe, especially good for entertaining. Not really traditional game grub, but like I said, if things had gotten bad last night we might have had to turn the tv off. So at least we would have had the meal to enjoy. As I said in a text to Will last night, gnochhi for dinner. so even if we lose at bball we win at eating. Hilarious post! We are Heels fans so we were pumped!! Too bad you missed the mark with both team loyalties - it might not be easy at times, but my blood always runs red...GO PACK!!! I can't believe you just posted a recipe with pinenuts...I think I had a small allergic reaction just reading, and then typing, the word! I'm with you, Katherine. I was raised to cheer for my team first, any NC team second, and any ACC team third -- and never to cheer against anyone (at least not anyone in the ACC).